Soldiers of the 2nd Battalion, 113th Infantry continued down the road of transformation while on Annual Training this year at Fort Dix as they evolve from a mechanized force to light fighters. In those 15 days with some of the hottest and rainiest weather in mid-July, Soldiers completed their various tasks, drills and lanes training. Capt. John James of Operations said while Soldiers focused on their training for movement to contact the enemy, marksmanship, simulation training with coalition forces, and future Army technologies, emphasis was placed on the Soldiers’ physical conditioning. “We have these Soldiers for 15 days, so it is the command’s intent to build up their physical conditioning during this period,” explained James. Capt. Dennis Stiles, Battalion designer and controller for this year’s situational training exercise, created three lanes for Soldiers to train that ranged from 2,000 to 6,000 yards through the densely wooded areas of the installation. Soldiers conducted training mounted, as well as dismounted. 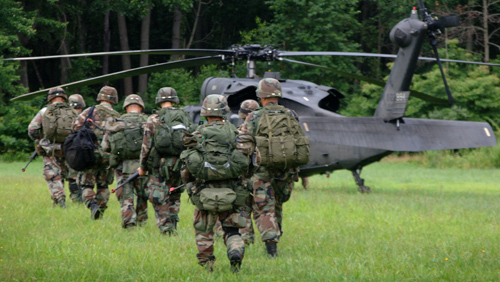 Stiles explained that during the training year leading up to the annual training period, Soldiers conducted individual task training that led up to such collective tasks as movement-to-contact with an enemy and moved into air assault operations conducted by the Guard’s 150th Aviation (Air Assault). Many of the aviation unit members on the ground were Operation Iraqi Freedom veterans. Infantry Soldiers were instructed on how operations work when aviators conduct their air assault missions. For example, flight paths and possibly false unit insertions may be critical to an operation. As part of the training, mortar and antiarmor teams were supporting the infantry Soldiers moving through the woods. The training was to prepare for the Army Training and Evaluation Program at the platoon level. “This training is pivotal for the National Guard’s Transformation Plan from a mechanized infantry to a light infantry unit,” noted Stiles. As Soldiers prepare to move through their lane for an enemy contact mission, a team begins to set-up a 360- degree security, while others begin to plan using a sand table for the unit movement and maneuver areas. Once the plan is complete, the group conducts a rehearsal and then links up with their respective team to move through the lane. “This year’s training offers a good perspective of what the future infantry Guard force will look like, as well as how it will operate. All the training has been great and it certainly established unit cohesion,” Sgt. Nick Colletti, Delta Company, said.